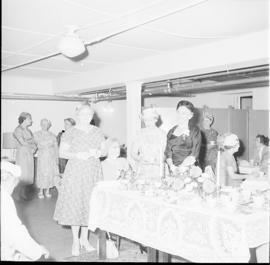 Series consists of photographs of local clubs and organizations in Guelph and Wellington County. Included are images of members involved in various club activities such as social events, fundraisers and awards presentations. Organizations included are the Cutten club, Guelph Rotary club, Guelph District Shine club, Guelph Optimist club, Guelph Sertoma club, the Italian - Canadian club and the IODE chapter of Guelph among others. Also included are photographs of labour relations organizations such as unions. Youth organizations and their activities are also captured in this series. These records document the role of public service, charitable and organized labour organizations in the life of Guelph and county residents. These records have been arranged by subject. As records continue to be processed, more photographs will be added to this series.